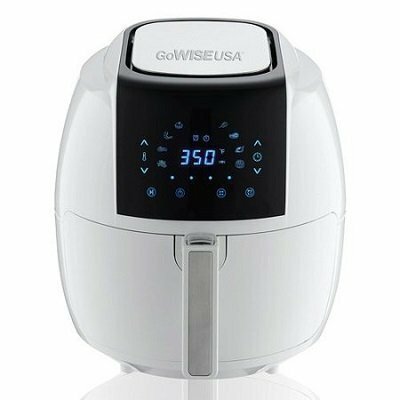 GoWise USA 5.8 qt air fryer is the most advanced GoWise air fryer to date. This 5.8 qt 8-in-1 air fryer now comes with a full digital display. Available in colors of black, red, white and plum, this large capacity xl air fryer can easily cater to your family of 4 – 6 members. The large LCD control screen comes with 2 new icons to press compared to the 3.7 qts models. There is a new set alarm button that can be set to 5, 10 and 15 minutes. This is great as a reminder to alert you to the food cooking in the fryer. This is indeed a great option to remind you to shake the ingredients in the basket. There is a new start/stop button that you can press when you wish to change cooking time and temperature in the middle of a cooking cycle. 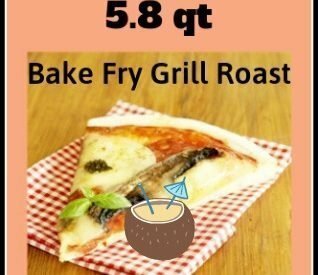 Fry, bake, grill, roast with little to no oil would certainly appeal to most people. This means less calories, less fat, healthier cooking. Well, if you’re looking to do just that, you should consider getting the hot air fryer. You’ll love the idea of cooking without oil or at the most, just a tablespoonful. Busy moms take note – no oil splatters to clean up. If you have to cook for 4 people or more, then the large capacity 5.8 qt air fryer xl would be a better option than the 3.7 qt model. Even if you are new to hot air frying, you would have no problem using the 5.8 qt air fryer with its in-built smart programs. 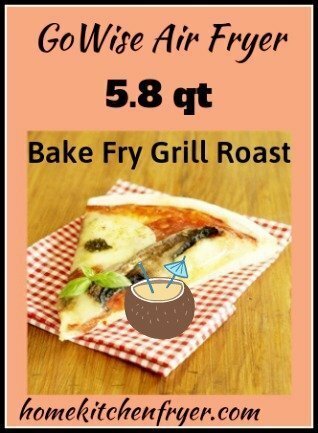 The xl fryer comes with 8 built-in smart programs including Fries, Pork, Shrimp, Cake, Chicken, Steak, Fish, and Pizza. Press the power icon, then press the built-in program icon. Press the power icon again to start cooking. The temperature ranges from 180°F – 400°F and can be adjusted in 10° increments. You can set the cooking timer up to 30 minutes. 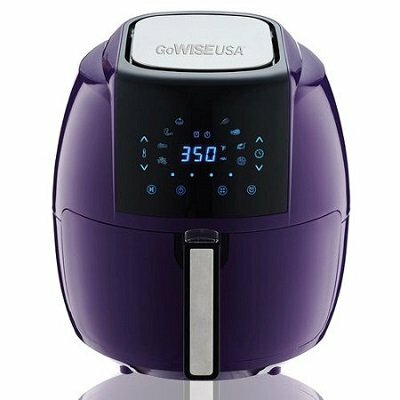 You can buy this air fryer as a set that includes 6 air fryer accessories plus a recipe booklet with 50 recipes. You can also just buy the air fryer plus the recipe booklet without the accessory set. 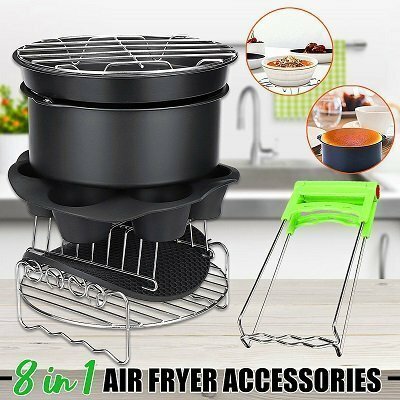 But I would recommend the package with the accessory set as these air fryer accessories can greatly expand your cooking options. Take for example the rack – you instantly get to double your cooking surface area which means that you can cook more at the same time. 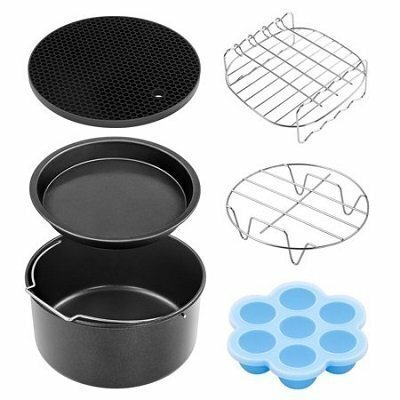 The baking tray/tin comes in extremely useful when baking cakes, quiches, muffins or curries. 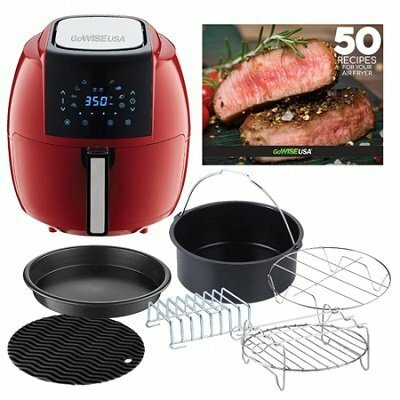 With this package, you get the 5.8 qt Gowise air fryer, baking pan, pizza pan, insert rack with 3 skewers, multipurpose rack, toasting/warming rack, silicone resting mat/pot holder and the 50 recipes booklet. 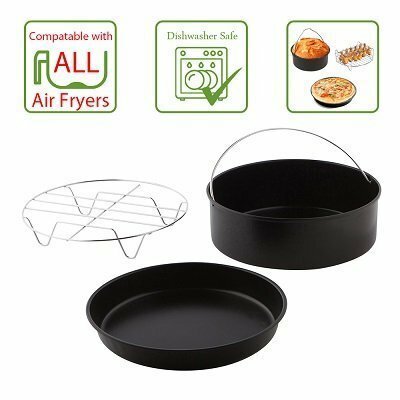 This 7″ air fryer baking pan/tray is non-stick and comes with a handle for easy removing from the hot air fryer. It is compatible for 3.7 qt and 5.8 qt air fryers. 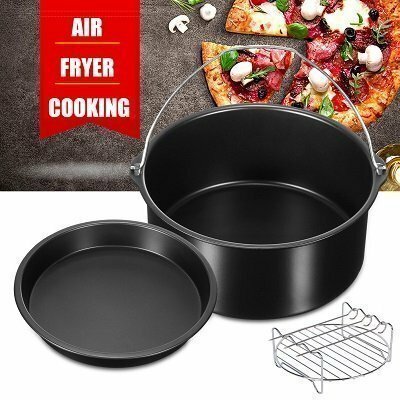 This 7″ pie/pizza pan has a non stick surface and can fit in a 3.7 qt – 5.8 qt fryer. If you’re into homemade pizza, then you’ll find this pan very useful. You can use it for baking cookies too. The rack will give you another layer of cooking. 2 layers of fish fillets cooking at the same time is certainly faster than a single layer and having to cook in batches. With the skewers, you can now cook kebabs. The 50 recipes booklet included comes with recipes for breakfast, lunch, dinner and dessert. This booklet is a great starting point. You can always get more recipes online or you might want to buy their air fryer cookbook for beginners. 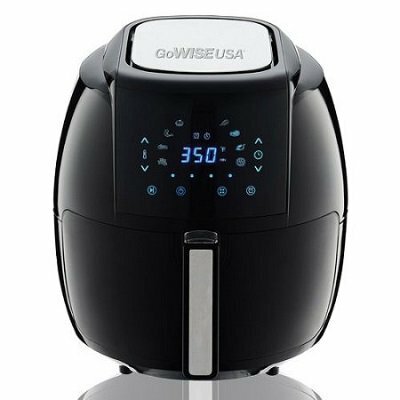 This GoWise USA air fryer 5.8 qt comes with safety features for an accident-free cooking experience. The removable basket comes with a cool touch handle. There is a button guard on the handle that prevents accidental detachment of the basket from the pan. To release the basket from the pan, you’ll need to push the clear button guard forward to reveal the release button underneath it. The pan is non-stick FDA-certified and PFOA free. The heating element is hidden in the top part of the fryer. The machine automatically shut-off when cooking is completed. However, you’ll still need to unplug the fryer for it to shut down completely. Slide the pan and basket back into the air fryer by carefully aligning the track inside the air fryer with the rim of the pan. To pause the cooking cycle and make your changes, first press the start/stop icon. Then press the appropriate icons to make the changes. The function of the alarm feature is to remind you to check on the food in 5, 10 or 15 minutes intervals into the set cooking time. Press the power icon, then choose one of the preset cooking modes or you can always manually set the time. Then press the alarm clock icon to choose the alarm time of 5, 10 or 15 minutes increments.